tags: Collapse into Now, R.E.M. They’re formulaic, and they all sound the same. I’m not talking about R.E.M. or their albums or songs, but rather, many of the R.E.M. album reviews I’ve read over the last 13 years. First, the common R.E.M. review pays perfunctory respect to the band’s status as one of the “most important bands of the last __ years.” Then it discusses the author’s favorite(s) among R.E.M.’s first eight albums, and the author says whether he/she favors the band’s darker, more inscrutable early albums, or their turn toward big-sounding arena rock in the late 80’s, or their turn toward wistful acoustic sounds in the early 90s. Then, almost invariably, the review says that 1996’s New Adventures in Hi-Fi was the band’s last good/great record, calls today’s R.E.M. irrelevant, and accuses the graying Stipe/Mills/Buck trio of weakening the overall R.E.M. legacy since the departure of founding member Bill Berry. With the arrival of each new R.E.M. record, this critical frame seems to solidify even further, to the point that it has, I would argue, calcified into a reactionary take that prevents the reviewer/listener/consumer from considering the band’s new music on its own merits. I hold a different view, which may be stated simply as the following—as a lifelong fan who holds a half dozen R.E.M. albums and dozens of songs among my very favorite music of all time, I want to continue liking R.E.M. and enjoying their current work. I’m not claiming that this view is less flawed or subjective than the one described above, but I think I can at least claim that it’s informed by giving each of their post-Berry albums a fair, open hearing (and absolutely not liking much of 1998’s Up and 2001’s Reveal, though each has some lovely songs, and clearly recognizing 2003’s Around the Sun as the band’s lowest point). From this vantage point, I view Collapse into Now as R.E.M.’s second borderline-great album in a row, following 2008’s Accelerate. The first seven songs on Collapse, from the clamoring, triumphant, occasionally chaotic opener “Discoverer” through the absurdly hooky “Mine Smell Like Honey” (love those classic Mike Mills backing vocals!!! ), are perhaps even strong enough to bring some of those (willfully?) disaffected fans and critics back into the fold. Each song fits well somewhere into the band’s body of work onward from 1986’s Life’s Rich Pageant. Ah, my dear Pageant…the album which to me serves as the clearest “before/after” dividing line in the band’s entire catalog. They never again sounded quite like the dark, moody, Byrds-meets-drunk-Southern-poets that we heard on Murmur, Reckoning, and Fables of the Reconstruction. But so what? Depending on your preferences, did they not give us 3-5 absolutely classic albums after this first major shift? And why not allow another shift to occur after 1996 and give at least some of these later songs a chance to become favorites as well, rather than viewing all of their post-Berry output strictly through the “declining” lens? OK, enough of the soapbox—back to the matter at hand. Among many great moments during these stellar seven songs, the extended, wordless coda of “It Happened Today” is perhaps the most joyous. In this guileless, unaffected, carefree exploration of a melodic theme, I hear a band that sounds entirely comfortable in its own skin and aware of exactly what it can and wants to accomplish, all at a level that I’m not sure they’ve achieved since 1992’s Automatic for the People. Regrettably, Collapse is front-loaded, and the latter third just isn’t very good. But still, if you’ve got even an inkling that R.E.M. as 50-year-olds may not be quite ready for the retirement home just yet, I encourage you to give the first 2/3 of Collapse your full attention. R.E.M.’s finest hours may have happened in the 1980s and 1990s (I do believe their last great album was Automatic for the People), but this band still has a voice that’s worth hearing. I just don’t see how writing and recording seven very, very good songs, while sounding energetic and motivated even on the songs that fall short, can possibly be any sort of stain on R.E.M.’s legacy. It’s time to dismantle that frame. I was joking with Amy the other day that the Decemberists had released the best REM album this year. But I have listened to ‘Collapse’ a few times now, and I like it much more than the last couple of releases. I agree that is definitely worthwhile. Awesome opening paragraph, Sensei Lloyd. What if every album review was written by someone who had no context of the artists’ past work, as if it was a “debut” record? What differences would we find within the critical reaction, as compared to the “formulaic” write-ups of the post- New Adventures in Hi-Fi days? I’d love to see how someone would assess the REM output if they discovered their entire catalog at the same time, instead of being forced to objectively analyze a recent release under the shadow of a monstrous history of incredible songs, all connected to crucial moments in one’s life. How does Accelerate stack up to Reckoning to new ears? I would bet that the results would surprise us. From the week Out of Time was released in ’91 through late ’92, when Automatic was dropped, I sort-of got to experience the entire catalog in a slightly-staggered manner. However, I had a passing familiarity with Green and Document (which I did not like when it was released), so I can’t quite serve as an example (although I could for Rush). 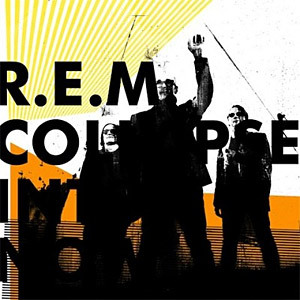 I think the new REM album “Collapse Into Now” is fantastic. I disagree that it’s front-loaded. I think each of this album’s 12 tracks is a contender for best on the album. There is no drop-off whatsoever towards the end. I think you may come to that same conclusion after a few more listens. I also think “Up” from 1998 was mostly brilliant. @Mark, I hope you’re right about the last few songs. Something about them didn’t click with me, but perhaps they will soon. I’ll give them a few more listens. And I do have great fondness for several songs on Up–especially Walk Unafraid and At My Most Beautiful (one of my favorite love songs of all time). I forgot to add simtehong which may amuse Dmitry. I hear the officials and the president, and I can see that we’re in full perestroika mode! This is going to end very badly, politically, simtehong that could accelerate or worsen the collapse that can be considered guaranteed anyway.I urge people to totally tune out the news and the speeches and the press. Do what you have to do, and do it now. Tilt up doors use fir, spruce and other soft wood; roll up uses oak, redwood or plywood.